There is plenty of anecdotal evidence that baseball fans tend to favor the broadcasters they hear regularly. The radio announcer, especially, becomes a season-long guest. Almost part of the family. There’s little doubt that the late Bill King became that sort of fixture in the Bay Area while calling Athletics games for a quarter of a century. Ken Korach makes a convincing case in “Holy Toledo” that King’s ability and influence transcended geography even though he wasn’t well known outside the Oakland and San Francisco markets. Korach was King’s partner in the booth for 10 years and makes no pretense of objectivity. Korach clearly admired his subject, and that’s all right, because he manages to celebrate the subject and humanize him all at the same time. The title refers to King’s catchphrase when something out of the ordinary happened. But the most telling clue to this book is the subtitle. 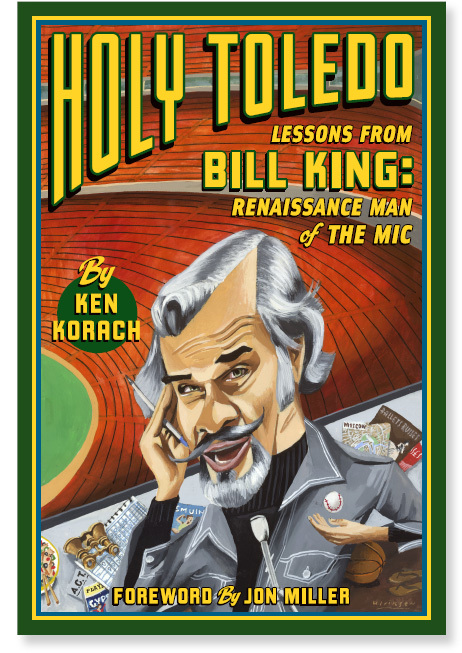 “Lessons from Bill King: Renaissance Man of the Mic.” This was one unique individual.